2- Get Windows 7 Basic light 1.0 at http://cinnamon-spices.linuxmint.com/themes/view/108 and Win7 menu emulator 1.0 at http://cinnamon-spices.linuxmint.com/applets/view/84. 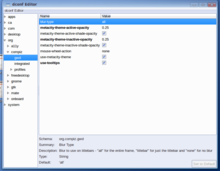 To install Windows 7 Basic light 1.0 decompress it in ~/.themes. To install Win7 menu emulator 1.0 decompress it in ~/.local/share/cinnamon/applets. 3- Download and install Windows 8 cursors at http://gnome-look.org/content/show.php/Windows+8+cursors?content=155025. To install Windows 8 Cursors decompress it in ~/.icons. 4- Download Windows 7 logo (png file) and scale it (Put the Width and Height 40 pixels). Then place it in your home folder (It would be better to make it a hidden file. Then go to Cinnamon Settings- Menu- Menu icon and choose the new logo . Then remove the Menu text. 5- Download a Windows 7 default wallpaper and set it as desktop background. 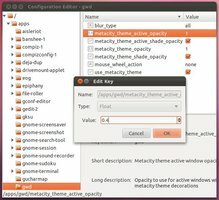 You can change the window theme from Cinnamon Settings. 7- Go to Cinnamon Settings- panel and check “use custom panel size…” and “allow Cinnamon to scale panel text…” then set the bottom panel height to 35 pixels. 2- Download and install Windows 8 cursors at http://gnome-look.org/content/show.php/ … ent=155025. To install Windows 8 Cursors decompress it in ~/.icons. 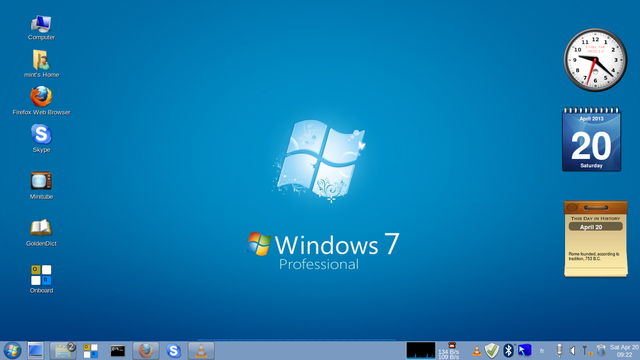 4- Download a Windows 7 default wallpaper and set it as desktop background. In Windows 7, frequently used programs can be pinned to the taskbar (hence called Superbar). 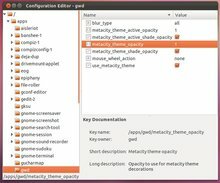 Likewise, DockBarX, a new applet can now be added to the MATE panel of Linux Mint to achieve almost the same effect to pin and unpin or launch the applications from the panel. 2- Double-click the downloaded file to install. 3- Log out and log back into the system, then right click the panel and click “Add to Panel”. Select the DockBarX Applet and click “Add”. When you run an application in the next log-in session, an icon will appear in the DockBarX on the panel. You can then right-click the icon to pin the application to the DockBarX or vice versa. Now, you can launch gconf-editor from Unity Dash. You can also launch it by pressing ALT + F2 key combination and running gconf-editor as a command. Once gconf-editor is launched, click on apps –> gwd on its left panel and then navigate to metacity_theme_active_opacity entry to make border of active window only transparent and metacity_theme_opacity entry to make border of all windows transparent. Since, we are making all windows borders transparent we will decrease the opacity values of both the entries. In this way, we can make borders of active windows as well as all other windows transparent. To decrease opacity level of a entry, we have to double click the entry. A Edit key dialog appears. In the Value section, decrease the value. Here in the screenshot below , we have decreased the value from 1 to 0.4 . Last edited: 2 years ago.